Next time you're in a Costabuck coffee shop and dithering over whether to have a skinny frappamochachocaccino (decaff) with maple syrup topped with mint sprinkles, spare a thought for the materials scientists musing on which components to blend for their latest designer materials. A splash of mercury, a twist of gallium, perhaps a soupcon of silicon or a dash of selenium and a can of tin. Well, researchers at Duke University in Durham, North Carolina, USA, have come up with "made-to-order" menu for materials. I covered the preliminary work on this project back in January 2014 (The search for cheapium) in which Stefano Curtarolo was hoping to find "cheapium" as opposed to "expensium". Curtarolo leads a seven-center consortium the AFLOW consortium which is pioneering an area of science its members like to call "materials genomics", hinting at a materials space akin to the biological space of the genetic code and the proteins it builds but with a chemical code that builds compounds. Duke's Ken Kingery recently wrote about Curtarolo's work on the Duke research blog, explain how materials genomics hopes to build up theoretical models of materials atom by atom to offer predictions as to how the products built from those atoms will behave. Take the bismuth strontium calcium copper oxides, which are being mooted as putative very high-temperature superconductors. There are many plausible variations on the basic scheme with different ratios of calcium, copper and oxygen against two bismuths and two strontiums. How might each variation behave? 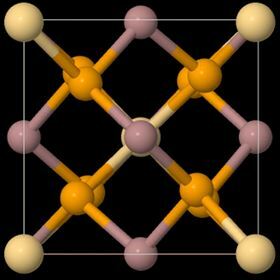 Would it be worth synthesizing with a view to testing its electronic and other physical properties? Might a slightly different variation be a better lead towards higher temperature superconductors? Materials genomics could answer such questions for this group of compounds and about the properties of others. The AFLOW approach automatically trawls materials databases to catch similar structures and builds up a picture of properties. Postdoctoral researchers Cormac Toher, Jose Javier Plata Ramos and Frisco Rose and student Harvey Shi have spent this year building a website app into which researchers can plug their elements of choice and the properties they want to design into a material and pluck out a match via the web. The first of the four databases used by the open source app draw from international collections of compounds of known structure and properties. The other three contain single- double- or triple-element ompounds and include materials that have not previously been tested. The app can currently trawl 622 000 compounds with about 1000 new entries added each week. You can search by almost limitless element combinations and desired properties. But, one thing it won't help you with is decide whether or not to hold the minty sprinkles or opt for cinnamon in your skinny frappamochachocaccino (decaff).